On May 24, 2012, the U.S. Senate narrowly voted against an amendment to further study genetically modified salmon before it is put into commerce, 46 – 50. Sixty votes were required for the bill to pass. The amendment, sponsored by Senator Lisa Murkowski (R-Alaska) would have “required environmental and economic impact studies of the first generally engineered animal in the human food supply,” according to a press release by the California Right to Know Campaign. 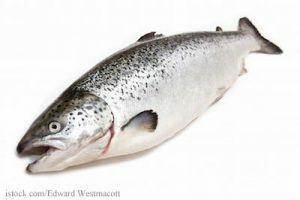 The salmon, created by AquaBounty Technologies, has been engineered to contain a growth hormone gene from the Chinook salmon and a genetic switch from an eel-like creature, the press release states. The growth hormone makes the salmon grow twice as fast as normal. The engineered female fish will be made sterile by inducing “triploidy”, so the cells that make eggs do not develop properly. In addition, containment measures at the land aquaculture facilities have multiple redundant barriers in place to prevent egg and/or fish movement to wild aquatic environments. In fact, although the FDA gave preliminary approval to AquAdvantage salmon in 2010, saying “except for minor issues to be addressed … the information provided by ABT … is acceptable and complete”, an FDA advisory committee has determined that more research is needed. Polls show that an overwhelming majority of Americans from all demographics and both major political parties want to know if their food contains genetically engineered ingredients. More than 40 other countries require these types of labels, according to the press release.